1- Water cooled evaporative chiller. 2- Air cooled evaporative chiller. 2- Centrifugal (Rotary Screw and Scroll). 1- Air-Cooled Absorption Single Effect. 2- Water-Cooled Absorption Single Effect. 3- Absorption Double Effect, Indirect-Fired. 4- Absorption Double Effect, Direct-Fired. 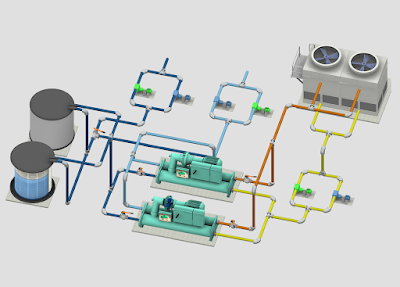 2- Chiller plant requirements include pumps, cooling towers, control and piping. 3- Energy cost at full and partial loads. 4- Water cost for water cooled chillers. 8- Unit size and weight. 9- Applicable codes and standards. Location of central plant shall be determined during the early stages of the project. Once type of chilled is selected, mechanical engineer shall coordinate with the other disciplines in the project to locate the chiller plan.